Jill began to explore her creative abilities in 1993 when she attended drawing and pastel classes with Lesley Charnock and Sherry Hornsey. This was followed by tuition in oil painting at the Artists' Co-Op in Observatory with the late George Taylor-Botha in 1995 and she has chosen to stay with this medium, favoring the permanence of oils. On and off since 2001 Jill has attended classes and workshops with Ryno Swart. Up to now Jill's focus has mostly been on creating peaceful, classic still life paintings of fruit or flowers although she has recently begun to try her hand at figure painting. She works from life and sets up lighting in her studio, enjoying sometimes creating fairly strong shadows. Besides the visual experience of painting a beautiful or colorful object, she enjoys the scent of roses or of fruit, and even the aromas of oil paints and genuine turpentine. She has a small collection of teddy bears, including a sixty year old English Chiltern and three German Steiffs, and these have been the subject of many paintings which have made their way into homes, and some doctors' consulting rooms, over the years. Jill simply gets her inspiration from life. She is inspired and grateful for the beauty of her surrounds and enjoys walking (but not playing!) on the golf course on which she lives and its surrounding nature trails. 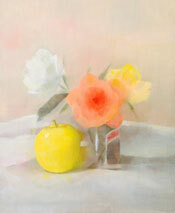 Jill Colley has exhibited work at several galleries in the Cape. Her paintings are included in private collections in South Africa, USA, Canada, Germany and England.